Features : 'Pumpable' Monsters - Monsters remain a challenge even at high levels, since they scale with the level of your heroes. Activated/Inactivated Map Spaces - These features create a more dynamic environment, as the map changes with conditions in the game. Hazards - These passages increase the effectiveness of traps played in them. 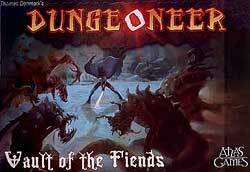 Play Dungeoneer: Vault of the Fiends as a stand-alone game, or add it to the Tomb of the Lich Lord deck for even more exciting dungeon delving adventures!